I loved Germany. Most of all I loved the beer in Germany. I took a picture of every new beer we tried…it’s an exhaustive gallery to be sure. 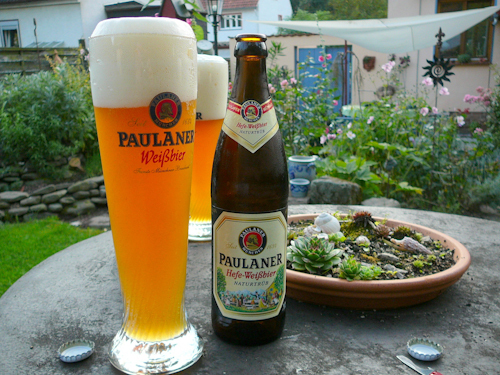 This one is one of my favorites; Paulaner Weissbier. Light and refreshing with hints of citrus, spice and clove. Enjoyed in my favorite place in Germany…Frank and Heike’s backyard. Prost! Oooh, I haven’t had that in a while. So good! When I was a teenager in Germany, we used to sometimes have it with a tiny bit of banana juice and it was called a Bananenweizen. I am of German heritage from Cincinnati, OH but never heard of the banana juice in beer but it actually sounds good. I Googled it and found that it goes best with wheat beer. The suggestion was 1/2 liter wheat beer (preferred Weihenstephaner) and 1/10 liter banana juice. They say it adds a slight bit of sweetness. @Sabrina: Bananaweizen just seems so disgusting. Though I like cola-weizen. Oddly enough, my first brush with German beer was in South Korea at a German themed bar run by a man who learned to brew in Germany. They only had the two beers, but damned if they weren’t good. It’s grown on my more and more as I’ve been exposed to more of it. Big fan. I’m not familiar in German beer but I want to try this sounds good..Thanks for sharing this photo to us..
Cola-Weizen? Never heard of that :) Close to Cologne, you’ll find that Koelsch-Cola is popular though! Nomadic Samuel recently posted..Thanks A Million! TheWorldOrBust recently posted..What to See and Do in Caracas, Venezuela!